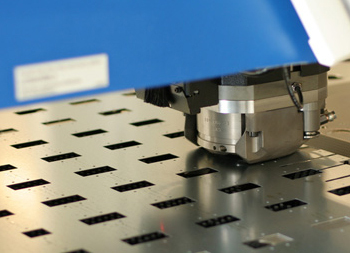 At Jupiter Design & Manufacturing, we have advanced CNC punching capabilities that allow us to perform several sheet metal fabrication processes in a single cycle. Our capabilities include forming, embossing, perforating, rolling, and lancing to create custom louvers, flares, ribs and other part features. We work with carbon steel, stainless steel, aluminum, and other metals to create custom sheet metal parts for customers in the HVAC, petrochemical, and other industries. Customers in the HVAC industry often require custom sized covers, vents, and grating with special louver patterns to facilitate air flow in the given application. Using our efficient CNC punching equipment, we can create these parts quickly, according to customers' prints, to keep projects on schedule. Punching and forming tools are kept in optimal condition to ensure that all cut edges are clean and introduce minimal stress to the part. Careful attention to tooling maintenance also prevents warping of thin materials and allows us to hold dimensional tolerances as tight as ±0.0005". The ability to process thin gauge stock without scratching the surface on either side, which is especially important for applications in which cosmetic appearance is a concern. We can process sheets up to 48" width and 120" in length, although longer parts can typically be accommodated by repositioning the material as needed. This capacity allows us to create larger cabinets and enclosures in addition to custom venting products. We can punch carbon steel up to 0.25" thick can be punched, while aluminum and stainless steel alloys up to 0.1875" thick can be processed. With a large inventory of punching dies available, we can process anything from prototypes to medium volume production very quickly. In addition to CNC punching and forming, we can provide custom plasma cutting, welding, and assembly, as well as repair of equipment parts. Using the latest manufacturing technologies, our team is capable of producing a wide range of part types for customers in an array of industries. For additional information about our CNC punching capabilities, please contact us directly.